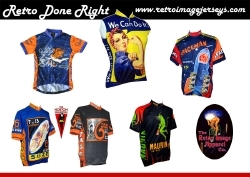 The Retro Image Apparel Company will be appearing at it's first Interbike Sept. 27-29, 2006. The company will showcase a deep line of glorious jerseys for men and women that bring to life stunning poster art from bygone eras of commercial graphic illustration. See Rosie the Riveter firsthand, the best selling women's jersey of 2006!